Two large footed bowls (compotiers ovales unis), 10½in. (27cm.) diam. Four footed shallow bowls (compotiers à bourrelet 2e grandeur), 8 3/8in. (21.3cm.) diam. Sixty-one plates (assiettes unis), 9½in. (24.2cm.) diam. 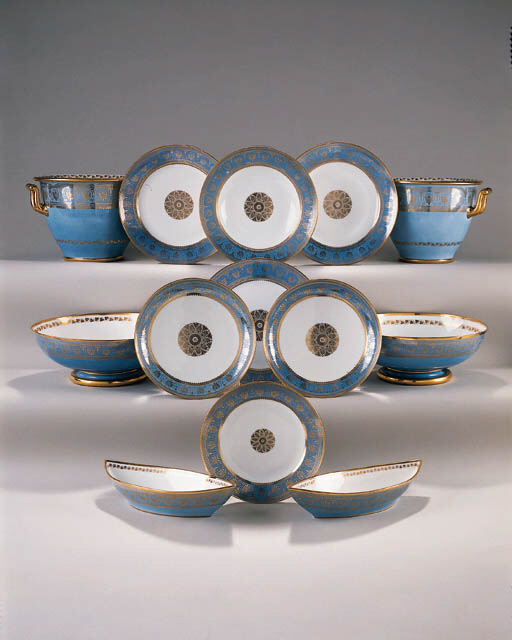 The museum at the Chateau de Compiègne retains 117 pieces from this service, similarly marked to the present examples of all the shapes presently included as well as other serving pieces, tea and coffee wares. Cf. Brigitte Ducrot, Porcelaines et Terres de Sèvres, Musée National du Chateau de Compiègne, Paris, 1993, pp. 159-170.